Cabbage is a vegetable that most of us are familiar with. If nothing else, we eat it in coleslaw. Cabbage is a very versatile vegetable that should be included in our menus as much as possible. It is low in calories, high in nutrients, and has valuable other compounds that help to protect our health. Furthermore, it’s a very inexpensive vegetable to eat, so why not go for it? Below is a video where I discuss the basics of cabbage, from what it is to how to use it and everything in between. Below the video are my notes for your personal use. Enjoy! Cabbage is a member of the cruciferous vegetable family and is related to kale, broccoli, collards, mustards, cauliflower, kohlrabi, and Brussels sprouts. According to the Economic Research Service at the U.S. Department of Agriculture (USDA), cabbage is the second most economical vegetable in terms of price per edible cup. In 2014, the average adult ate about 7 pounds of cabbage a year. That places cabbage as being the tenth most popular vegetable in America. In America, about half of all cabbage sold in the retail market is made into coleslaw. The production of sauerkraut accounts for another 12 percent. Cabbage has few calories, with only 22 in one cup (raw). Yet, that one cup of cabbage contains 85% of the recommended daily intake (RDI) of Vitamin K and 54% of the RDI for Vitamin C. It also contains notable amounts of folate, manganese, Vitamin B6, calcium, potassium, and magnesium. Green cabbage is the type that is most commonly eaten, and has many health-promoting qualities including antioxidants that help keep inflammation in check, reducing the risk for certain cancers, helping improve digestion through its insoluble fiber, and benefiting heart health. However, red or purple cabbage has those benefits and even more special qualities that make it a valuable addition to your diet. The red or purple color reflects its content of compounds that have unique antioxidant and anti-inflammatory properties. So, red or purple cabbage is especially valuable to include in your diet on a regular basis. Choose a head of cabbage that is firm and seems heavy for its size. Look for leaves that appear fresh, crisp, and tightly packed, with little blemishes. Larger heads tend to have a milder flavor than smaller heads. Cabbage can also be purchased pre-shredded, which is a great convenience if your time in the kitchen is short. Even though it is already washed, it’s a good idea to wash it again just before using it. Be sure to use it before the “Best by” date to ensure freshness. It is noteworthy that the Vitamin C content of cabbage diminishes when it is cut, so pre-cut cabbage will have less Vitamin C content than a whole head. Keep cabbage in the refrigerator, wrapped in plastic to retain moisture. Most resources say cabbage will keep for two weeks this way. Freeze: Cabbage may be frozen and used later in cooked dishes. Cabbage that has been frozen would not be suitable for raw dishes, like coleslaw, because the texture will change after being frozen. To freeze cabbage, wash the leaves and cut them into desired size pieces. Blanch shredded cabbage or small pieces in boiling water for 1-1/2 minutes and cabbage wedges for 3 minutes, then immediately place them in a bowl of ice water until completely cooled. Drain well and place in freezer bags or containers. Frozen cabbage will keep for 10 to 12 months. Some people freeze cabbage without blanching it first. Cabbage frozen this way should be used within 4 to 8 weeks. Dehydrate: Fresh cabbage may be dehydrated. Some resources say cabbage can be dehydrated without being blanched. However, this method does not stop enzymes that will cause the vegetable to continue to age, nor does it kill any pathogens that may be on the food. Reliable sources emphasize blanching cabbage before drying it. Process as for the freezer then follow your dehydrator manufacturer’s instructions for the temperature and length of time to dry your cabbage. Dehydrated cabbage can actually be eaten as a snack and is sometimes used by backpackers as a lightweight food to carry along the trail. Fresh cabbage is commonly found at most grocery stores, whereas frozen cabbage is only found in select stores. Fresh is the most versatile since it can be used raw or cooked, whereas frozen cabbage must be used in cooked dishes because the texture is not suitable for raw use. Cabbage is eaten both raw and cooked in a variety of ways. Some people don’t care for cooked cabbage because of a sulfur odor that it can produce. This happens only when the cabbage is overcooked. So, to prevent the unpleasant odor that can come from cooked cabbage, cook it with as little water as possible and for as short a time as possible (unless you’re adding it to a soup or stew). Remove and discard any withered outer leaves. Rinse the remaining leaves and cut as needed for your intended use. If you are using cabbage that was freshly picked, such as from your garden or the farmer’s market, you may want to take extra measures to remove any insects that may be lurking among the leaves. In this case, soak the head in salt water or vinegar water for 15 to 20 minutes first, then rinse it well to remove any insects, dirt, and salt or vinegar. Then proceed as usual. Cabbage can be eaten raw, as in salads and slaws. Cabbage can be cooked in a number of ways including being stuffed, sautéed, steamed, boiled, braised, roasted, added to soups and stews, pickled, and fermented. Cabbage is very versatile, so this is certainly not an all-inclusive list! 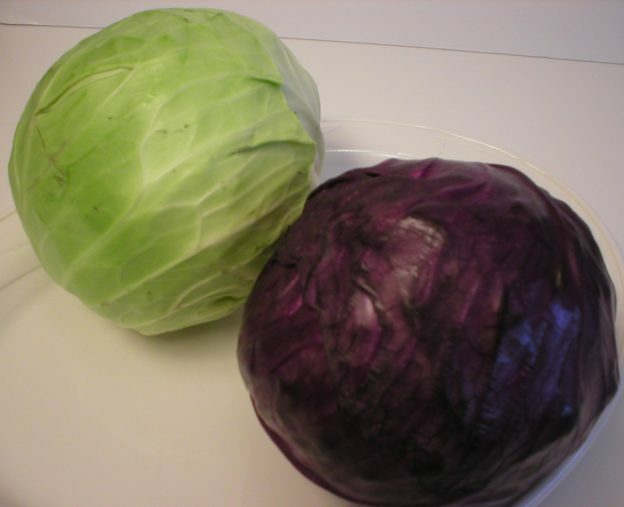 This entry was posted in Food and tagged About cabbage, Cabbage 101 The Basics, cabbage information, cabbage nutrition, cabbage recipes, how to freeze cabbage, how to store cabbage on March 29, 2019 by Judi.